Retail Display Cube - 356mm - Ships Same Day! Retail display cube is 356mm on each side, great for floors & stacking! Looking for a retail display cube to better promote your products? 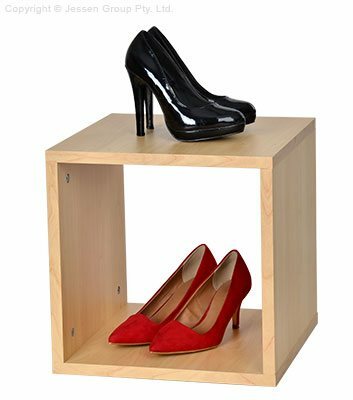 These merchandising cubes effectively draw in customers and allow for a wide variety of configurations to help highlight purses, shoes, and so many more items. The wood retail fixture has an open design for a modern look, with the large interior able to hold a variety of styles of products. The versatile display can also have items placed on top for an eye-grabbing look when combined with interior promotion! The retail display cube, like many store fixtures, features a small footprint but can still effectively market your products. The stand is 356mm on each side, and able to be stacked atop one another to create a taller display that better draws attention. 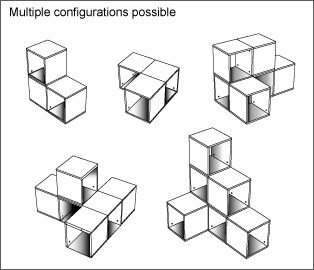 Weighing only 2.16kg, stacking the cubes in a variety of the aforementioned different configurations allows for funky styles that complement the modern aesthetic of this pedestal. Made of MDF, the laminated maple finish fits in with any décor and is standard for many shopping centres, retail stores, and more. This fixture ships knocked down to keep shipping costs lower, and assembly is quick and easy. Only a screwdriver is needed for set-up in minutes. Australia-wide despatch is offered with all products, and most items ships same day from Slimline Warehouse when in stock and purchased by 2pm EST!